The holidays have come and gone and after a couple of weeks in California and week in Vegas, it was nice to be home, but sad to have to box up the Christmas decorations. We got together with our friends and played with their kids. 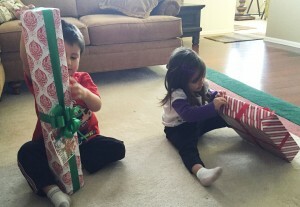 They seemed to really enjoyed the Christmas gifts we gave them, an indoor/outdoor tent and a s’mores roasting kit. They play “camping” in their own living room regularly, so we thought that they’d like a “real” camping tent of their own. 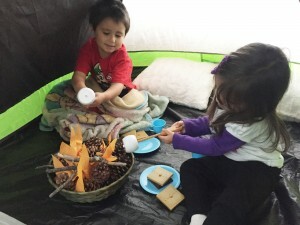 Not one quarrel about sharing the tent as each kid had their own s’more, roasting stick, plate and a hot chocolate cup which helped with any “disagreements” when playing. 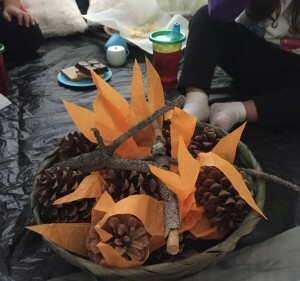 However, they didn’t hesitate to inform us that they didn’t have a fire to roast their marshmallows, so I had to come up with something quick, which was a basket, some pine cones, twigs and a sheet of orange tissue paper cut into flames. Whew! Since it was a very cold and snowy weekend, they happily camped indoors with their “crackling” fire. They played for hours until nap time and continued to play afterwards, roasting and serving their s’mores and hot chocolate creations to us until bedtime. It was a fun weekend for all. . .
Sooo S’mores? When was the last time I had a s’more? It’s been a while. So, ironically, when I was going through my recipe collection tear-outs this week, I came across this s’mores cupcake recipe from the July 2014 issue of RealSimple magazine. So, I put it aside to test. But the second irony came when my friend recruited me to help her make some “quick” box cupcakes (to celebrated her son’s birthday at school) over a needed girls night. 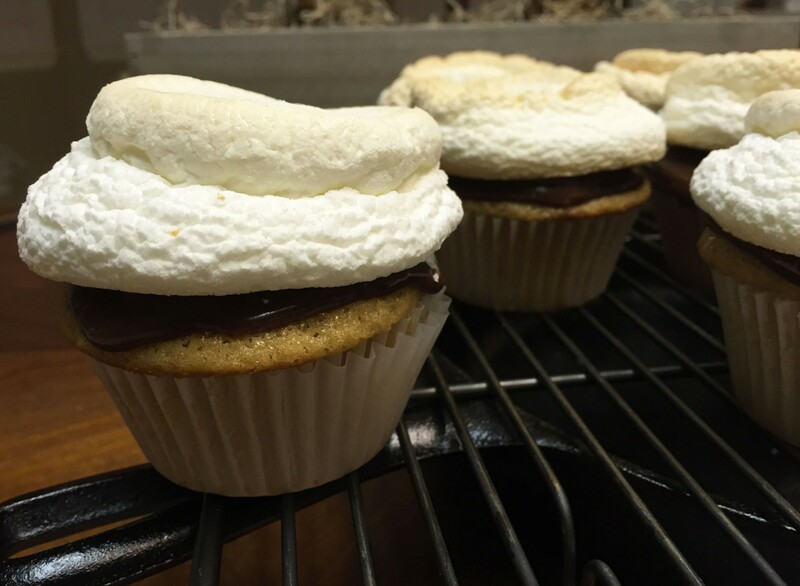 But I had a better cupcake recipe that was just as quick and very kid friendly – the s’mores cupcake recipe that I just set aside! 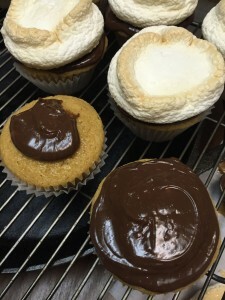 So when my friend came over to see what I had started, she couldn’t believe it was the same recipe that her birthday boy had shown her back in July when he saw the same s’mores cupcake picture from her RealSimple magazine! I guess it was meant to be his birthday cupcake after all. So, here it is. The cake recipe could not have been easier. I suggest that If you do not want to crush your own graham crackers, buy the graham cracker crust mix for pie crusts. You will get three recipes out of one box. This recipe overall was quick, easy and was a hit with the kids! It taste’s just like a s’more, too. And if you choose to make the ganache, it’s REALLY easy and fool-proof. 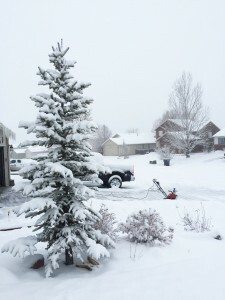 No need to adjust the recipe for high-altitude. 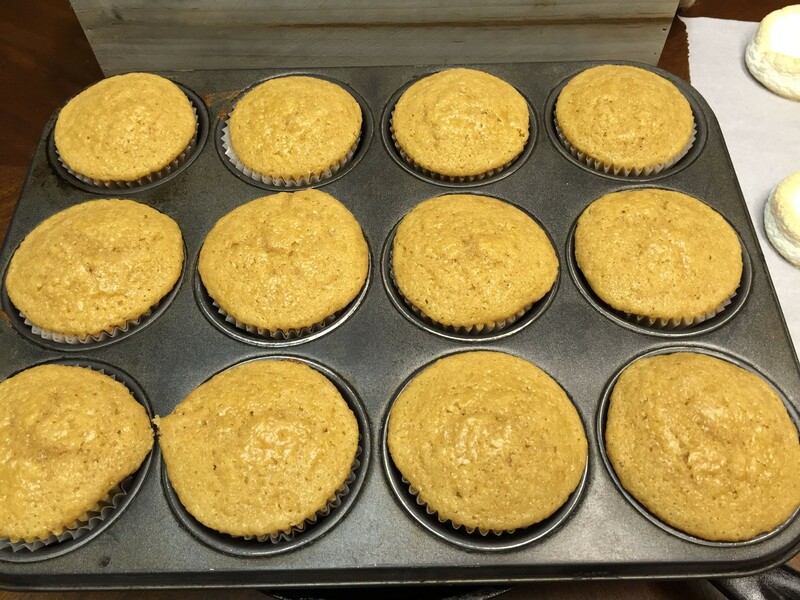 Be sure to distribute the batter evenly between the 12 cups, as the batter fills 12 cups perfectly. Cupcakes always look better when the cake just bakes over the edge of the paper liner. Bake the marshmallows at 350 degrees. If you do not want to make the ganache, you can use a pre-made chocolate frosting. I highly recommend Hershey Chocolate frosting and no other. Stick with the closest thing to the “real” chocolate flavor of a Hershey Chocolate bar. No need to be a cleaver icing professional as the chocolate ganache is under the toasted marshmallow that does all the decorating work for you! Step 1 For cupcakes: Heat oven to 350 degrees with the racks in the middle of the oven. Line standard 12-cup tin with paper or foil liners. Step 2 In a medium size bowl, whisk graham crackers, flour, baking powder and salt together. Set aside. Step 3 Beat the butter and sugar with electric mixer on medium-high until light and fluffy about 2-3 minutes. Step 4 Add eggs one at a time, then add vanilla. Step 5 Reduce the mixer to low and add the dry ingredients and milk alternatively, beginning and ENDING with the DRY ingredients and mixing well between additions. Mix until JUST combined (do not over mix or you will have a tough cake). Step 6 Divide batter between muffin cups (the batter fills all 12 cupcakes perfectly). 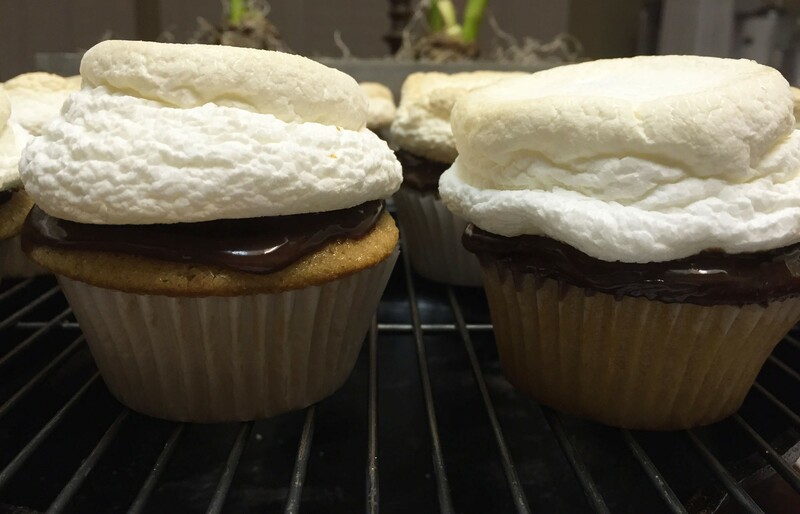 Bake rotating once until toothpick inserted in the center of the cupcake comes out clean (between 16-22 minutes). My cupcakes baked for 19 minutes. I let them cool in the tin for about 10 minutes before removing. At high altitude, baking time is usually reduced, so be sure to check them before your set baking time. 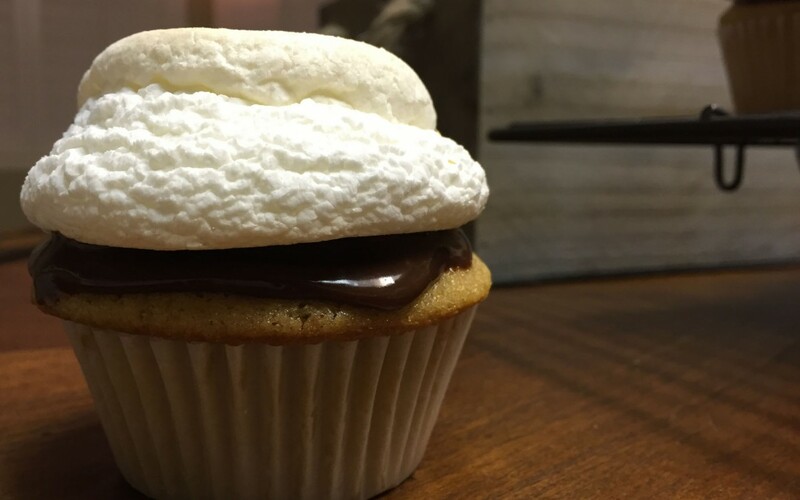 While cupcakes cool, make the ganache. Step 7 Bring heavy cream to a boil on medium heat in a small pot. Remove from heat and add the chocolate chips. Let sit for 5 minutes. Whisk to combine. Let cool slightly. Now make the marshmallow topping. Note: I placed my ganache in the freezer for 10-15 minutes because I found that even thought I allowed the ganache to cool, it ran down my first cupcake. Step 8 Place marshmallows 2.5 - 3 inches apart on a parchment-lined baking sheet. 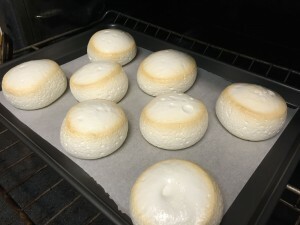 Bake at 350 degrees on the top rack until JUST slightly browned and very puffy (time will vary-approximately 4-6 minutes). Watch carefully as you don't want to over cook them. Transfer the parchment on to a cool surface (marshmallows will stick to the parchment). Allow to cool for 1-3 minutes then release them from parchment paper. They should remove fairly easily. 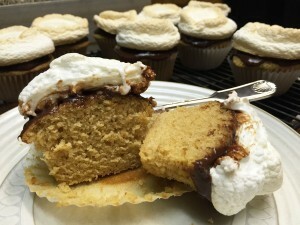 Step 9 Spread about a tablespoon of ganache evenly on to the cupcake, then top with a toasted marshmallow. I gave my marshmallows a little twist for added security. Step 10 These tasty treats are decadent and fun to eat. Thought, be warned they are just as good and messy as the original s'mores campfire sandwich!